Foliage is a funny old thing. People disregard it as just 'greens', but it's the mainstay of almost all floral design. There's a vast range of different textures and colours available, and it's an easy way to fill spaces in the cutting garden and create permanent structure . These are my 5 favourites, all of which are easy to grow in most of the UK. A lovely evergreen, the green and variegated varieties are very vigorous, once they're established they grow quickly. The purple variety 'Tom Thumb' is much slower but its beauty makes it worth finding space for if you can. It will grow anywhere that's not in full shade or exposed to cold winds and is just perfect for bouquets - nice straight stems topped with a bushy spray of small branches covered in leafs. My favourite is Pittosporum tenuifolium 'Elizabeth' - a variegated varitety with pink tinges to the leaf edge. Pitto 'Elizabeth' looking gorgeous and picking up the pink and cream flowers in this wedding bouquet. You can see stems of eucalyptus and dusty miller too. An essential for florists that grows surprisingly well in the UK, just give it a sheltered spot. They are incredibly vigorous - never plant close to a building as their roots are BIG - remember this is a tree! They are easy to care for, for cutting it's best to pollard (cut right back down to ground) every 2-3 years. As they get bigger the leaves will change from small and round to long crescents, both of which are useful for floristy. Different varieties will give different sized and shaped leaves. It also lasts well out of water, making it perfect for use in Christmas and dried arrangements. You can also start from seed undercover in late winter and grow as an annual. 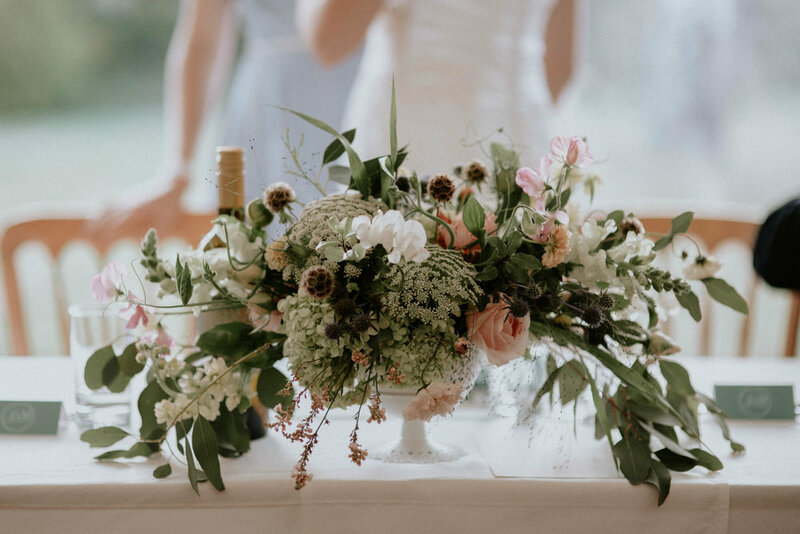 This wedding, set in beautiful formal gardens in Devon, used lots of this Eucalyptus 'Silver Dollar' which is one of my favourites. Photo from Jessica Williams Photography. Lovely evergreen shrub with dark green leaves, that will grow in full shade so is a perfect foliage plant for north facing spots. It's real value is in winter where the delicate white flowers bloom when little else does. When the flowers finish you're rewarded with blue-black berries that pair beautifully with dark hydrangeas for some late winter drama. My favourite is Viburnum tinus, though other varieties give better berries. The viburnum flowers here blend beautifully with the waxflower and, with all the leaves stripped away, would be a brilliant substitute for a customer wanting all British flowers. I'd be sad to remove them though, they're just too lovely! A slightly more unusual one, there are lots of different varieties of Acacia/Mimosa, most of which are covered in fluffy yellow flowers during spring. I don't have one in my cutting garden at present, but I put an Acacia pravissima in my parent's sheltered garden in South Devon a few years ago and it's huge, even with me constantly chopping bits off it. It would grow well in walled gardens or in coastal areas. It has a wonderful weeping habit which makes it perfect for trailing designs and modern bridal bouquets. The acacia here on the left of the arrangement drapes beautifully and adds a lovely movement to designs, I wish I'd taken a photo of this plant in spring when it's smothered in yellow flowers. AKA Jacobaea maritima, part of the Asteraceae family. This beautiful soft grey foliage plant is easy to grow from cheep seeds or plugs. It's a short lived perennial, I keep it for two years before it gets too woody and I pull it out and start again. It's a great one for the cutting garden because the more you cut the bushier it gets. It's very on trend, the ends need searing in boiling water after harvest, but once conditioned lasts well. I'm growing a fuller leaved variety called 'Cirrus' and one of the filigree leaved ones too. 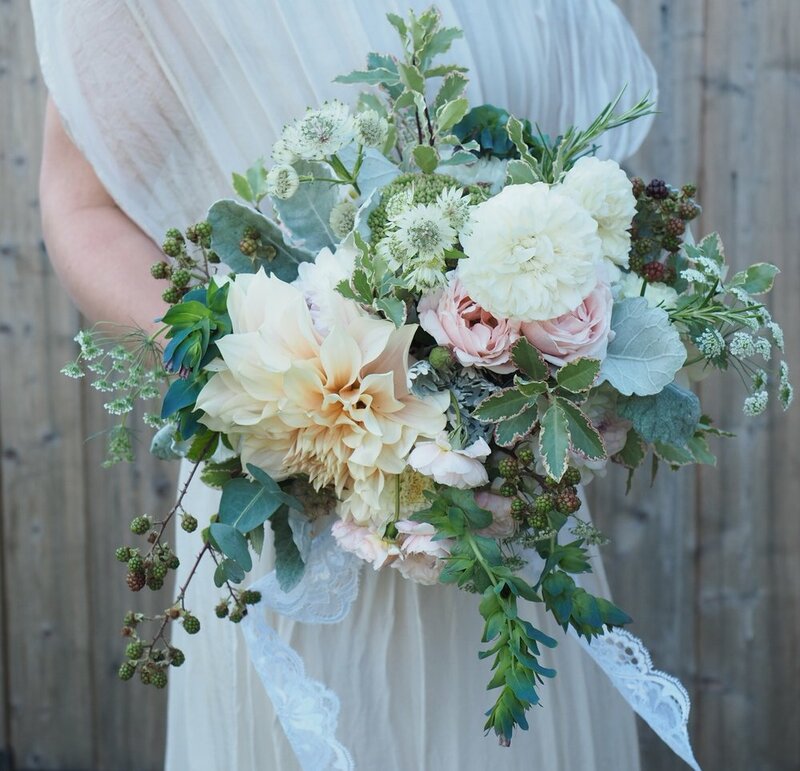 Dusty Miller from the cutting garden taking a supporting role in this August Bridesmaid's bouquet. So there we are, my top 5 foliages. Of course there are endless different types and choosing just a few is so hard (I've completely left out annual foliages like bupleurem, Bells of Ireland and cress which are all well worth growing) but I'm confident that these will all earn their keep with minimal effort from you. If you have a favourite foliage that I haven't mentioned here and you think I should be growing, please do let me know in the comments below - I can always find a space for something new!